During our INSET day today, staff met in their ‘Learning Development Group’ (LDG) for the last session of the year. Each LDG focuses on a specific area of teaching and learning and is an opportunity for staff to share good practice. My group has been looking at outstanding teaching and learning throughout the year. Over the course of the year we have become clear about the fact that there are 4 key aspects of good teaching. But with outstanding teaching, each of these is deepened. So, questioning is well planned, focused and probing. Thought is given to what questions will be asked, how and when. Creative resources and prompts may be used to support questioning. It will also involve a large number of students and be well scaffolded. As a result, student thinking is challenged and supported, enabling them to develop a much deeper understanding of the key ideas. One colleague described effective questioning as being ‘relentless’. This challenge is further developed by the teacher having an in depth knowledge of the curriculum and the students they are teaching. As a result, the pitch of the learning is appropriate for all – high challenge, but low stress. Feedback is rich, focused and highly personalised – and comes in written and verbal form from both the teacher and peers. Independence is developed well – but well balanced. By this we mean that there is a good blend of teacher instruction and independence – so when students need to work on their own, they are able to do so with confidence and without an over-reliance on the teacher. 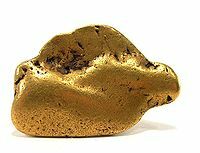 The LDG sessions have supported the idea of ‘deliberate practice’ as a means of effective teacher development – something that has been explored brilliantly by Alex Quigley (@HuntingEnglish) – see here. Our interpretation of this is very simple and illustrated by the model to the left. 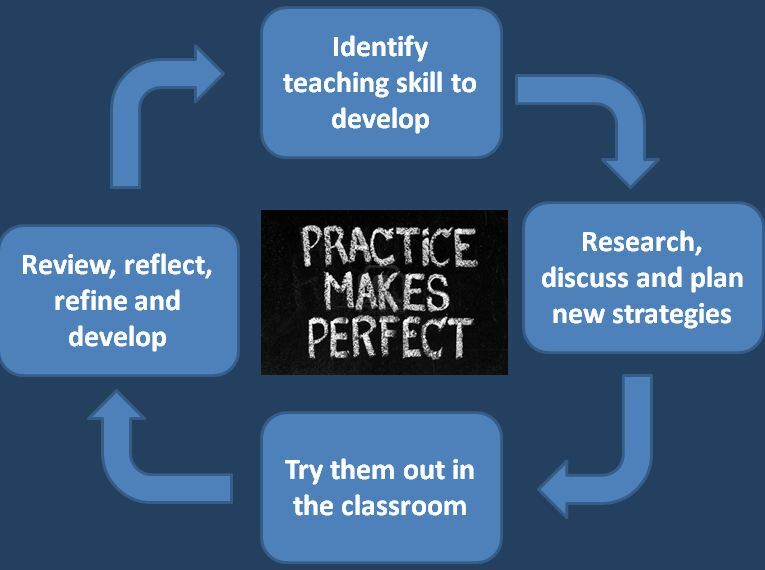 It is a continuous cycle, whereby teachers identify an area of their practice they want to develop, research it, try it out in the classroom, reflect and review it’s effectiveness and then repeat until perfected! I have been trying to promote independence through a range of strategies. The struggle sometimes is how to keep the students engaged in extended tasks and how to promote ‘deep learning’. As a result, this year I have been using ‘carousel’ and ‘competition’ tasks – but always with challenging and differentiated resources. This seems to have been successful in terms of students staying motivated, learning deeply and maintaining independence. In PE I have used iPads and iPods to video analyse student performance. They have then given each other detailed and personalised feedback. This has had a great impact on improving engagement. SOLO taxonomy has been really useful in terms of raising student awareness of stages in learning development and so providing them with feedback on how to improve. The questioning grid has been a great resource to use as a learning hook – and to encourage students to come up with their own questions about the learning – which has then deepened their understanding. Students have been recording their responses to questions on video and then using subtitling software to annotate and explain their thinking. This has really developed their thinking – as they have to think about and reflect on their own thought processes. Developing the use of a range of questioning techniques, by simply pre-planning the key questions (linked to the key learning) I will ask – and when – include how I will scaffold them for support and challenge. Developing the idea of using speaking games like ‘Taboo’ and ‘Just a Minute’ to get students engaged and discussing the work with each other. Encourages peer feedback. Linking marking to targets and then encouraging students to discuss with each other whether they have achieved their targets and why – great peer feedback. Focusing on more student led activities e.g. students coming up with questions for each other. Great for developing ownership of learning and a deeper understanding. Using activities like ‘4 pictures, 1 work’ as a learning hook to engage students and generate discussion. 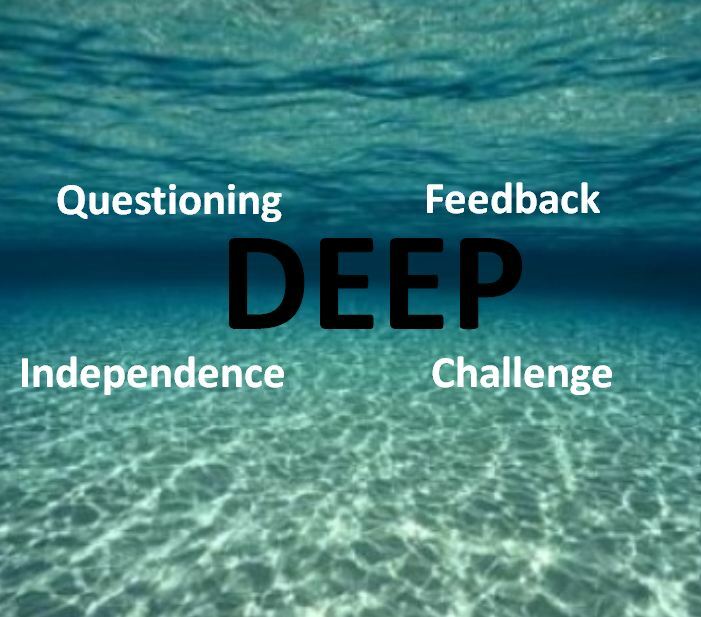 Using a ‘big, deep question’ to generate discussion and thinking at the start of the lesson – and then coming back to this at the end of the lesson. Use of RAG (Red, amber, green) cards in planners to encourage students to reflect on how they are doing during tasks (they have the appropriate coloured card out depending on how confident they are feeling about the task). This is great as it enables me as a teacher to target those in need and encouraging students to help others who are struggling – requires no extra planning and works every time. Ensuring that every lesson has an engaging question ‘hook’ e.g. an image to inject challenge into the discussion. When questioning students think about how to scaffold in order to build complexity and give students time to think about their response – not just expecting an instant answer. Giving students the opportunities to not only say what level they think their peers are working at – but why. And then what they need to do to get better. Many thanks to all of the teachers in this group, for their great ideas and input. This entry was posted in CPD Events and tagged Challenge, Feedback, Independence, outstanding, Questioning. Bookmark the permalink. The vibrant and engaged community of teachers you have there is really inspiring. It’s rare to find a school with such a consistent sharing of great ideas and I take my hat off to your efforts. Just great. I really like how there is a dedicated time and structure for teachers to talk and share their students’ learning. I assume these groups are composed of teachers from different subject areas, which is particular awesome as it breaks down silos and focuses all teachers on student learning. Looking forward to more of your posts. Sharing ideas in a similar way has had huge effect at our school-it’s wonderful to see experienced teachers queuing to grab NQT ideas and equally great to provide the opportunity to re-distribute leadership of the hubs. We internally accredit colleagues who then try out hub ideas, feedback and then evaluate the impact of their ideas-they get a certificate, hand-shake, kiss and the micky them out of them in briefing! Thank you for sharing your ideas-some of ours are on our web-site [Meols Cop High]-we have lots more for anyone who contacts us! I have recently been given the role of teaching and learning/assistant head of maths department. I love sharing good practice and ideas with my fellow teachers. We have an hour every two weeks to discuss and develop schemes of work. I am looking for ideas to develop independent learning and ways of engaging low-ability ks4 pupils. Your articles have guided me in structuring our departmental meetings regarding teaching and learning. Thanks for the message Edith. Glad to hear that the blog is useful. Keep up the great work.